Purpose: The objective of this review is to estimate the prevalence of refractive errors, uncorrected refractive error (URE), and uncorrected presbyopia in adults aged ≥30 years in India. 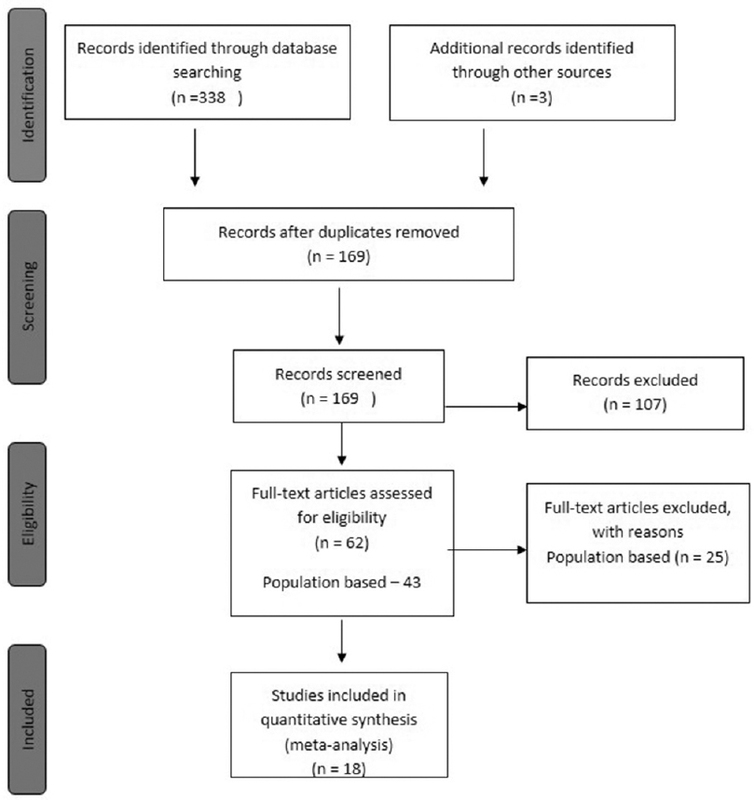 Methods: The Preferred Reporting Items for Systematic Reviews and Meta-analyses (PRISMA) guidelines were followed. A detailed literature search was performed to include all studies published from India from the year 1990 using the Cochrane Library, Medline, and Embase. Refractive error was defined by >0.50 D ametropia. 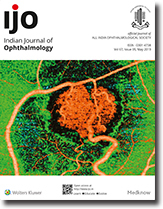 URE was defined by presenting visual acuity (PVA) worse than 6/18 improving with pinhole or spectacle correction, and uncorrected presbyopia by near vision Results: Fifteen studies were included from South India, one each from Western and Central India, and one study covered 15 states across India. The prevalence of RE of at least 0.50 D of spherical equivalent ametropia was 53.1% [(95% confidence interval (CI): 37.2–68.5), of which myopia and hyperopia was 27.7% and 22.9%, respectively. The prevalence of URE was 10.2% (95% CI: 6.9–14.8), but heterogeneity in these estimates was very high. The prevalence of uncorrected presbyopia was 33% (95% CI: 19.1–51.0). 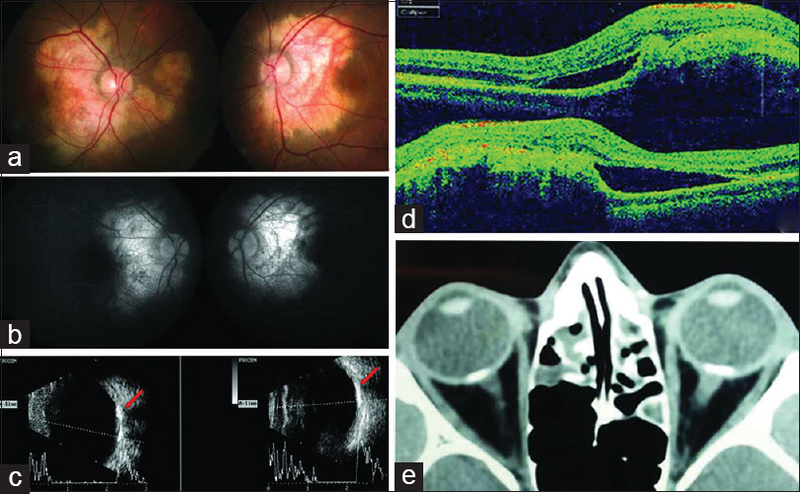 Conclusion: This review highlights the magnitude of refractive errors among adults in India. More studies are needed using standard methods in regions where there is a lack of information on UREs. Programs delivering spectacles for adults in India will need to primarily focus on reading glasses to correct presbyopia along with spectacles for hyperopia and myopia. Purpose: To compare the safety and efficacy of tacrolimus 0.03% ointment with dexamethasone 0.05% ointment for subepithelial infiltrates (SEIs) following adenoviral keratoconjunctivitis (AK). Methods: A randomized, double blind trial was done. Eligibility criteria was corrected distance visual acuity of 6/9 Snellen or worse for at least 4 weeks with corneal SEIs following AK. The grading of SEIs was done on a scale of 0 to 3; 0, no infiltrates, 1 mild infiltration, 2 moderate infiltration and 3, severe infiltration. Consecutive patients with SEIs following AK were randomized to receive either topical tacrolimus 0.03% or dexamethasone 0.05% ointment twice daily for 6 months. Treatment was successful if there was reduction of SEIs and improvement in vision. Results: A total of 45 patients each were assigned to the Tacro and Dexa groups, respectively. Baseline characteristics of patients did not differ significantly (P > 0.001). There was a significant change in symptoms, vision and SEIs in both the groups. However, the magnitude was greater in tacro group. Treatment was successful in 37 (92.5%) patients in Tacro and 34 (85%) patients in dexa group. In dexa group, after a period of 1.24 ± 0.24 months, 7 (15.6%) patients developed a significant rise in intraocular pressure (IOP). Three (7.5%) eyes in tacro and 6 (15%) eyes in dexa group had recurrence of SEIs after cessation of therapy. Conclusion: Tacrolimus 0.03% is an effective alternative to dexamethasone 0.05% with low recurrence rate, no significant rise in IOP but may cause burning and foreign body sensation in some patients. Purpose: To evaluate the optical quality and tear-film dynamics in patients with aqueous-deficient or evaporative subtype of dry eye disease (DED). Methods: Twenty-five aqueous-deficient dry eye (ADDE) patients, 25 DED patients with meibomian gland dysfunction (MGD), and 25 healthy subjects were included in this study. Vision-related health-targeted quality of life was evaluated using the Ocular Surface Disease Index (OSDI) questionnaire. Dynamic recording with a double-pass system (Optical Quality Analysis System [OQAS]) was performed in right eyes. Scattered light was measured as the objective scatter index (OSI) at 0.5-second intervals over 20 seconds without blinking. Then, we recorded OSI every 0.5 seconds within a 20-second period with the subjects asked to blink freely. Several parameters were established to evaluate the dynamic alterations of optical quality and the effects of blinks: OSI, OSI standard deviation (SD), ΔOSI, ΔOSI/time, blinking change (BC), and blinking frequency (BF). Additional clinical examination included tear film break-up time (BUT), Schirmer I test (SIT), fluorescein staining grade (FL), meibomian gland quality, meibomian gland expressibility, and meibomian gland drop-out. Results: The OSI, SD, ΔOSI, ΔOSI/time, BC, and BF were significantly higher in DED patients than controls (P < 0.01, respectively). The OSI, SD, ΔOSI, ΔOSI/time, BC, and BF were significantly higher in patients with MGD than patients with ADDE (P < 0.01). In the MGD group, BUT, FL staining score, lid abnormality, meibomian gland expressibility, and meibomian gland drop-out were correlated with Δ OSI and Δ OSI/time. Conclusion: Dry eye patients with MGD had significant alterations of optical quality compared with ADDE patients. The double-pass system has potential to be a useful quantitative method to evaluate the optical quality and tear-film dynamics in patients with dry eye. Purpose: To evaluate the patient demographics and morphological characteristics of corneal endothelium by in vivo confocal microscopy (IVCM), in patients with Iridocorneal Endothelial (ICE) Syndrome. Methods: In this retrospective observational series, IVCM acquired endothelial images of patients with ICE syndrome were evaluated. 'ICE cells' morphology was classified as “−” or “+” if they were larger or smaller than contralateral normal endothelium. It was correlated with patient demographics and clinical manifestations. Results: IVCM was performed on 41 eyes of 21 patients, with 13 males (62%) and 8 females (38%). The disease was unilateral in 19 (90.5%) and bilateral but asymmetric in two (9.5%) patients. Total ICE was seen in 91% eyes. Eighty percent patients (12 out of 15) with ICE—cells were males while 83.3% (5 out of 6) patients with ICE + cells were females. Mean age of patients with ICE- cell type and ICE + cell type was 45.8 ± 17.8 years and 40.3 ± 9.2 years respectively (P = 0.02). 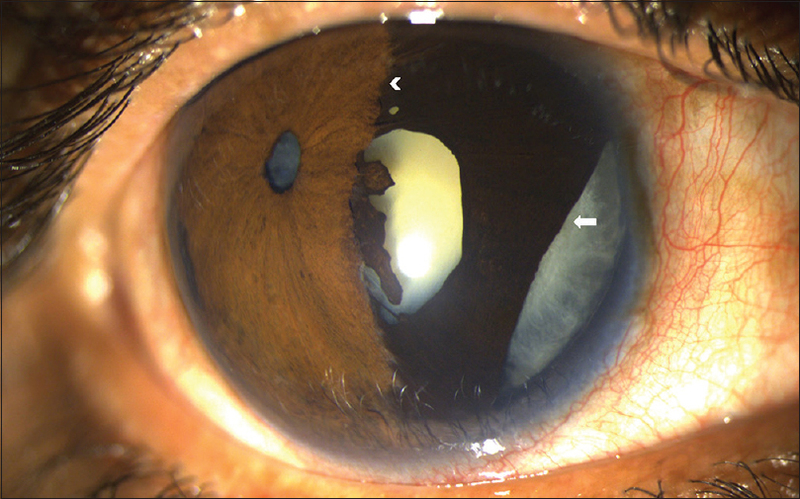 Both ICE – and ICE + eyes had similar incidence (33.3%) of corneal edema. ICE + eyes had more severe (grades 2/3) glaucoma (n = 5/6 eyes, 83.3%) compared to ICE – eyes (n = 8/15 eyes, 53.3%). Conclusion: A male preponderance, predilection of ICE – and + cell variants for male and female gender respectively, lack of association of the endothelial cell morphology with corneal edema, and apparent association of ICE + phenotype with more severe glaucoma occurring at a relatively younger age, are some novel findings of the present study. In the clinical setting correlation of patient demographics with these IVCM findings may help in better long-term prognostication of eyes with ICE syndrome. Purpose: To investigate the quality of discharge teaching, readiness for hospital discharge (RHD), and post-discharge outcomes (PDO) of cataract patients in a day ward and to explore the relationships among these three variables. Methods: This cross-sectional study used an opportunistic sample from the ophthalmic day ward in a general hospital in Sichuan province, China. Data were collected using four questionnaires. Results: The total average score on the Quality of Discharge Teaching Scale was 192.95, and the dimension with the lowest score was “guidance obtained practically.” The total average score on the Readiness for Hospital Discharge Scale was 175.51, and the dimension with the lowest score was “knowledge of disease.” The total average score on the Post-Discharge Outcome Questionnaire was 77.08, and the four dimensions with the lowest scores were “compliance behaviors,” “avoiding excessive use of eye,” “avoiding strenuous exercise,” and “regular check-up.” Pearson correlation coefficients indicated low to moderate correlations between discharge teaching quality and PDO (0.245, P < 0.01), RHD and PDO (0.271, P < 0.01), and discharge teaching quality and PDO (0.559, P < 0.01). Conclusion: The quality of discharge teaching among cataract patients who underwent day surgery was relatively high, and patient preparation for discharge and PDO were good. However, medical staff should focus more attention on patients' individualized needs for discharge teaching while emphasizing the importance of compliance behavior. Purpose: To compare the outcomes of active-fluidics based torsional phacoemulsification in diabetics and nondiabetics using a balanced tip. Methods: Two hundred and forty-eight patients undergoing senile cataract surgery using torsional phacoemulsification on an active-fluidics-based platform from December 2016 to August 2017 were included in this prospective, nonrandomized, interventional cohort study; of the 248 patients, 54 were controlled diabetics and 194 were nondiabetics. Intraoperative parameters such as cumulative dissipated energy (CDE), total ultrasound time, torsion usage time, torsion amplitude, aspiration time, and fluid usage were documented and compared. Endothelial cell loss (ECL) and central corneal thickness (CCT) were evaluated at 1 month postoperatively. Results: Diabetics and nondiabetics did not differ in CDE, total ultrasound time, torsion amplitude, aspiration time, fluid usage, endothelial cell count, and CCT. ECL on Day 1 (10.2 ± 8.0%) and Day 30 (11.05 ± 8.3%) were significantly higher in diabetics (P = 0.025 and P = 0.045, respectively). There was an increase in CCT on Day 1 (P = 0.018), which settled by Day 30. Grade 4 cataracts in diabetics had significantly higher CCT at Day 1 (P = 0.032) and Day 30 (P = 0.007). In the diabetic subgroup, Grades 3 and 4 cataracts required lower CDE (P < 0.001) and Grade 4 cataracts showed higher ECL than others till 1 month of follow-up (P < 0.05). Conclusion: Intraoperative and postoperative parameters after torsional phacoemulsification are comparable in diabetics and nondiabetics. Endothelial changes and pachymetry may be related to the grade of cataract in diabetics. 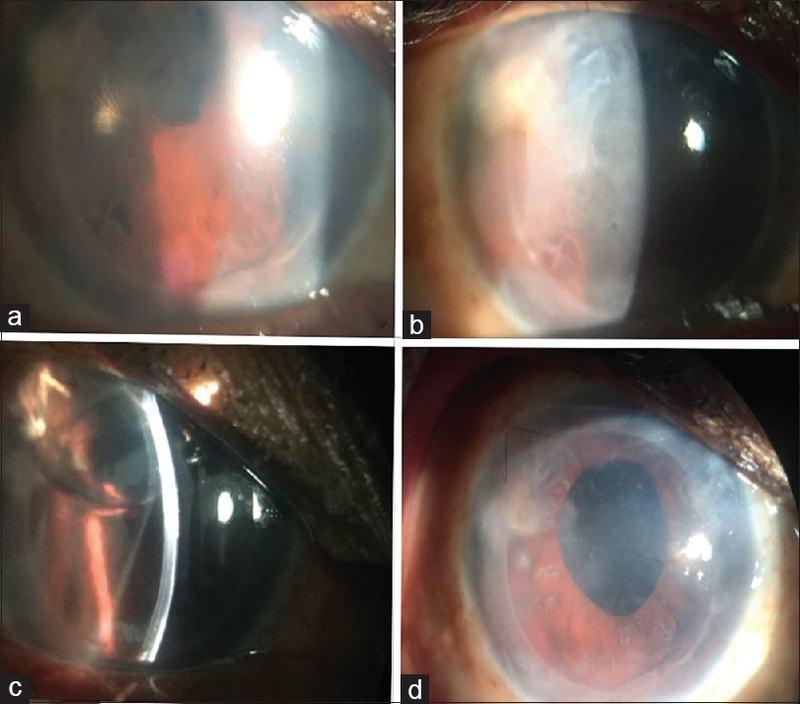 Purpose: To compare the intermediate-term refractive outcomes of a single-step and a two-step approach for silicone oil removal (SOR) and cataract surgery. Methods: Case records of patients who had SOR and phacoemulsification (PE) from 2011 to 2013 at a tertiary center in South India were retrospectively analyzed. A total of 135 eyes that underwent ultrasound biometry (UB) were studied. Eighty-seven eyes had SOR and PE at a single surgery (Group A), where as UB was done in a silicone oil (SO) filled eye. Forty-eight eyes had SOR followed by PE later (Group B), where UB was done in a fluid-filled eye. The refractive error (RE) and best-corrected visual acuity (BCVA) at postoperative day 45 (D45) and postoperative month 3 (M3) were compared. Results: Baseline axial length, intraocular lens (IOL) power, and RE in both groups were comparable. A myopic shift (4.18 ± 5.47 diopters [D]) was noted in 92% eyes at M3. Forty-nine percent eyes had a RE of ≤±1.5D at M3. 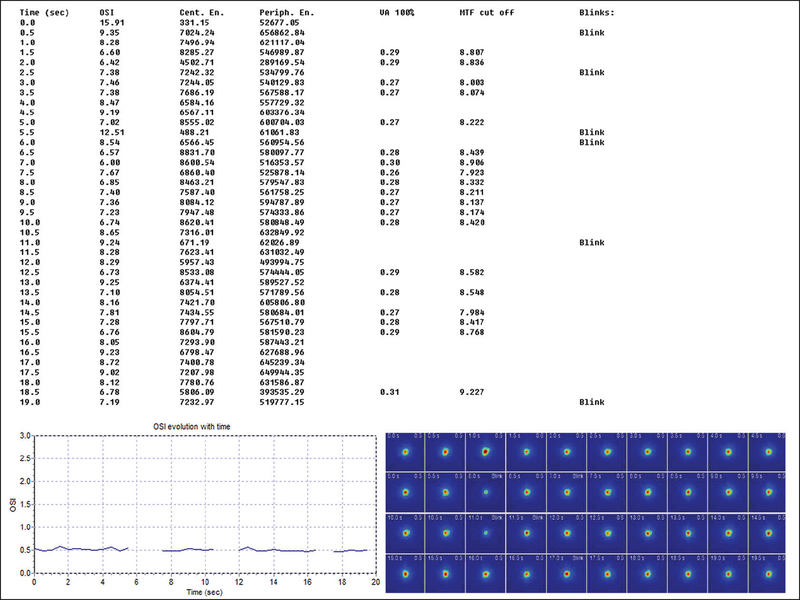 RE at D45 and at M3 was significantly lesser in Group B (−1.73 ± 2.04 vs. −0.64 ± 1.75; P, 0.002). BCVA was significantly lesser in Group A at baseline, at D45, and at M3 (P < 0.01 for all). There was no difference in other baseline characteristics of eyes that had RE ≤±1.5D and those that had RE >±1.5D at M3. Conclusion: SO-filled eyes had a myopic shift in refraction after SOR and PE. When UB is used for IOL power calculation, better refractive outcomes are obtained when SOR and PE are performed in a two-step approach. Purpose: To report a series of central retinal artery occlusions (CRAO) following cataract surgery complicated by posterior capsular rupture (PCR). Methods: Data from 14 patients with acute CRAO following cataract surgery was collected for this study including subject demographics, initial and final best-corrected visual acuity, systemic investigations, optical coherence tomography (OCT) and fundus fluorescein angiography (FFA) findings. Results: Mean subject age was 59.9 ± 12.1 years. Male: Female ratio was 1:1. All patients were operated between October and November 2015 and presented with acute vision loss 1 to 4 days after surgery. All the patients underwent cataract surgery under peribulbar anesthesia and had PCR for which anterior vitrectomy (AV) was done. In all the cases Ethylene oxide (ETO) sterilized vitrectomy probe was used for AV. Clinical picture of CRAO was noted in all the cases during the immediate postoperative period. 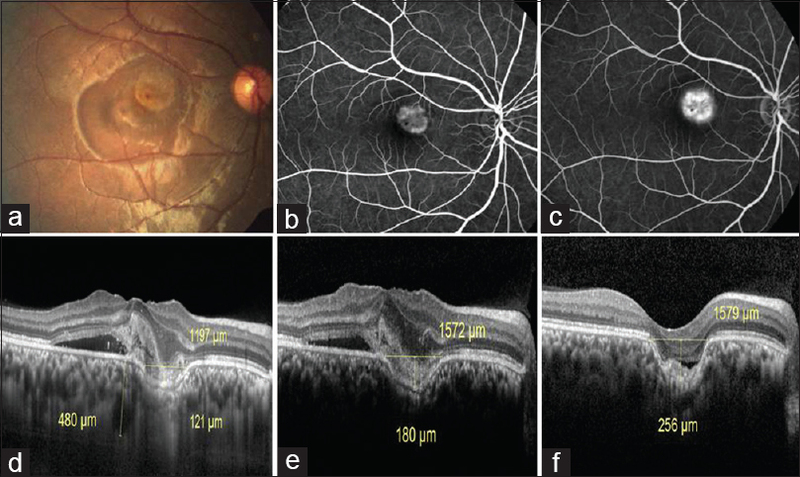 OCT showed inner retinal layer hyperreflectivity while FFA was normal in all the cases. The final visual acuity was poor in all the eyes. This paper discusses the possible mechanisms of CRAO in these cases. Conclusion: CRAO is a potential complication of peribulbar anesthesia for intraocular surgery in patients with vascular risk factors and hence any substance that can aggravate the vasospasm in such patients should be used cautiously. Vasospasm could be caused by ETO as residual ETO could be present in the vitrectomy machine tubing causing toxicity. It is recommended to be cautious while using ETO sterilized instruments for cataract surgery. Purpose: We conducted a prospective, randomized study to evaluate the efficacy of dexmedetomidine as an additive to peribulbar block for vitreoretinal surgery in terms of onset time of block, hemodynamic stability profile, patient comfort, and surgeon satisfaction. Methods: One hundred patients of American Society of Anesthesiologists grade 1 and 2 scheduled for vitreoretinal surgery were randomly assigned into two groups: control group (n = 50) received lignocaine bupivacaine block, and Dex group (n = 50) received lignocaine bupivacaine plus 20 μg dexmedetomidine peribulbar block. Information regarding time for onset of block, hemodynamic data, visual analog scale for pain, sedation levels, total duration of surgery, and surgeon satisfaction levels were collected. Results: All the demographic characteristics including age, gender, American Society of Anesthesiologists grade, onset of anesthesia, and duration of surgery were comparable in both groups. At the baseline, there was no statistically significant difference in heart rate, mean arterial pressure, diastolic blood pressure, and respiratory rate between the two groups, with a difference noted in systolic blood pressure at the baseline. There was significant difference noted in the systolic blood pressure and mean arterial pressure at different time intervals with a decreasing trend as time progressed. 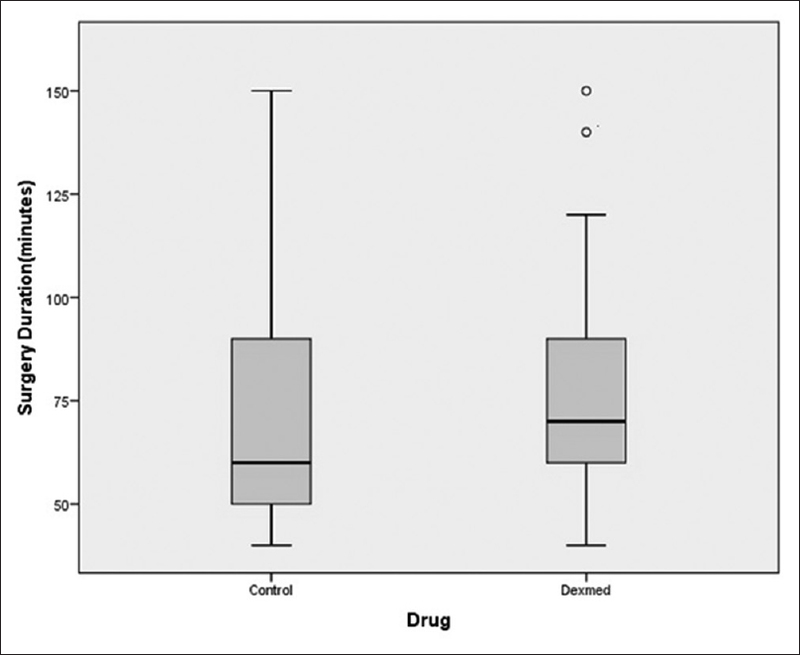 The mean sedation score was significantly higher in the Dex group than that in the control group. The surgeon satisfaction was higher in the Dex group than that in the control group. Conclusion: Dexmedetomidine is a useful and safe drug in combination with lignocaine bupivacaine in peribulbar for vitreoretinal surgery as it maintains hemodynamic stability and provides sedation, which enables full cooperation and potentially better operating conditions. 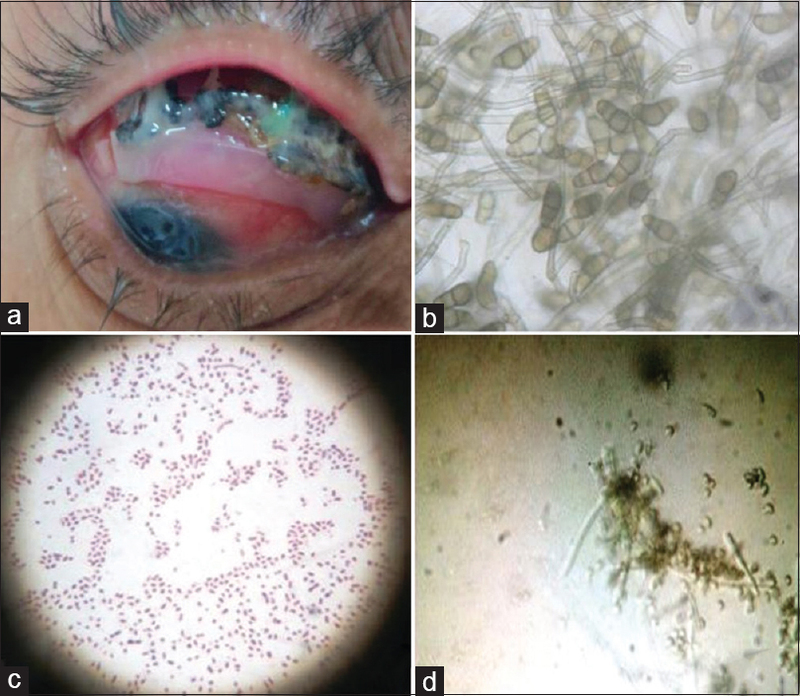 Purpose: The aim of this article to study causative organisms for scleral buckle (SB) infections in North India. Methods: A retrospective review of records was done for all patients who have undergone SB removal at our institute between January 2009 and December 2017. The records were analyzed for etiological agent of the infected buckle and its antibiotic sensitivity. Results: A total of 43 samples were analyzed and a positive culture was noted in 35 (81.40%) cases. The buckle infection rate at our institute was noted to be 2.53%. The commonest organism causing SB infections was Staphylococcus – 15 (42.6%) cases, followed by Pseudomonas – 6 (17.14%) cases and Fungi – 6 (17.14%) cases. The median interval between retinal detachment surgery and buckle explantation was 3 years. Conclusion: A large variety of organisms may cause SB infections. The commonest organism found to cause buckle infections in our study was Staphylococcus sp. Purpose: To compare different macular thickness parameters and peripapillary retinal nerve fiber layer (RNFL) thickness between recently diagnosed cases of multiple sclerosis (MS) without optic neuropathy (ON) and healthy individuals. Methods: This cross-sectional study was performed between June 2014 and June 2015. All subjects underwent ocular and retinal examination. Spectral domain optical coherence tomography (SD-OCT) was used to measure the thickness of different layers of the retina at macular and peripapillary regions and at different quadrants. 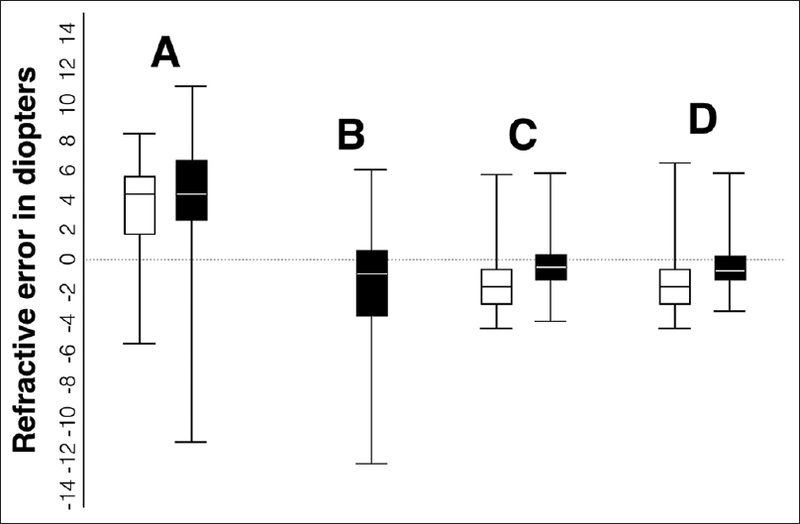 Between groups comparison was performed with P < 0.05 indicating statistical significance. Results: There were 32 eyes in the MS group and 74 eyes in the control group. The MS group was significantly younger than the control group (P < 0.001). The mean ganglion cell complex (GCL++) thickness in superior macular area was 64.1 ± 8.9 μ in the MS group and 71.1 ± 5.9 μ in the control group. The thickness of the RNFL did not statistically differ in each of the quadrants between groups. Despite controlling for age, the macular thickness parameters were significantly thinner in eyes with MS compared to healthy eyes (P < 0.01). Conclusion: The macular ganglion cell complex (mGCC) parameters were significantly reduced in recently diagnosed cases of MS as compared to healthy individuals. Purpose: To describe the influence of corrected refractive error on measured torsional fusional amplitudes (TA) by comparing the TA between emmetropes and spectacle corrected myopes, using the after-image slides of the synoptophore, as targets. Methods: Fifty emmetropes (Group I) and 50 myopes (Group II) with best-corrected acuity of 6/6 in each eye were included in the study. Near point of convergence (NPC), near point of accommodation (NPA), and horizontal fusional amplitudes (HFA) were assessed in all the subjects. After-image slides, both horizontally aligned, were used as targets (without the bright flashes). One of the slides was rotated inwards, till cyclo-diplopia was reported by the subject; the procedure was repeated with the slide rotated outwards. The sum of the two readings was taken as TA. NPC, NPA, HFA, and TA were analyzed. Results: There was no significant difference in the NPC, NPA, and HFA between the two groups. The emmetropic subjects had significantly better torsional amplitude (8.4 ± 1.4 degrees) compared to myopes (7.7 ± 1.5 degrees, P = 0.03). We postulate that this difference may be due to perceived image minification, which brings the edges of retinal image of the targets closer to the fovea, thus rendering the myopes lesser tolerant to cyclodiplopia than emmetropes. Conclusion: Refractive error, corrected with spectacles, influences the measured TA. Myopic subjects have lesser torsional fusional amplitude than emmetropes. Purpose: This study aims to evaluate normal orbital structures with nonenhanced computed tomography (NCCT) and determine normative data for the Indian population. Methods: CT images of the orbits of 100 patients were retrospectively reviewed on a work station to record the normative data of the orbits. Clinical details of all patients were reviewed to ensure that they did not have ocular/orbital diseases. Both axial and coronal images were utilized to record the data. Results: The mean age of the population evaluated was 34.07 years, with male to female ratio of 1.77. The average orbital index for the left orbit was 97 and for the right side was 103. The mean thickness of left inferior rectus, lateral rectus, medial rectus, and the superior rectus was 3.36 mm, 3.14 mm, 3.80 mm, and 3.75 mm, respectively. The right inferior rectus, lateral rectus, medial rectus, and the superior rectus measured 3.46 mm, 3.14 mm, 3.83 mm, and 3.78 mm, respectively. The optic nerve sheath complex diameter varied between 3.05 mm and 7.17 mm for the left eye and 3.05 mm and 7.0 mm for the right eye. Conclusion: The study provides normative data on various orbital structures in an Indian population. This data is likely to be useful for diagnosing various orbital pathologies and in planning surgical orbital procedures. Purpose: To describe the outcome of external dacryocystorhinostomy (DCR) as a suitable alternative to dacryocystectomy (DCT) in cases of isolated lacrimal sac rhinosporidiosis. Methods: This was a retrospective, interventional case series. Institutional review board approval was obtained for the study. 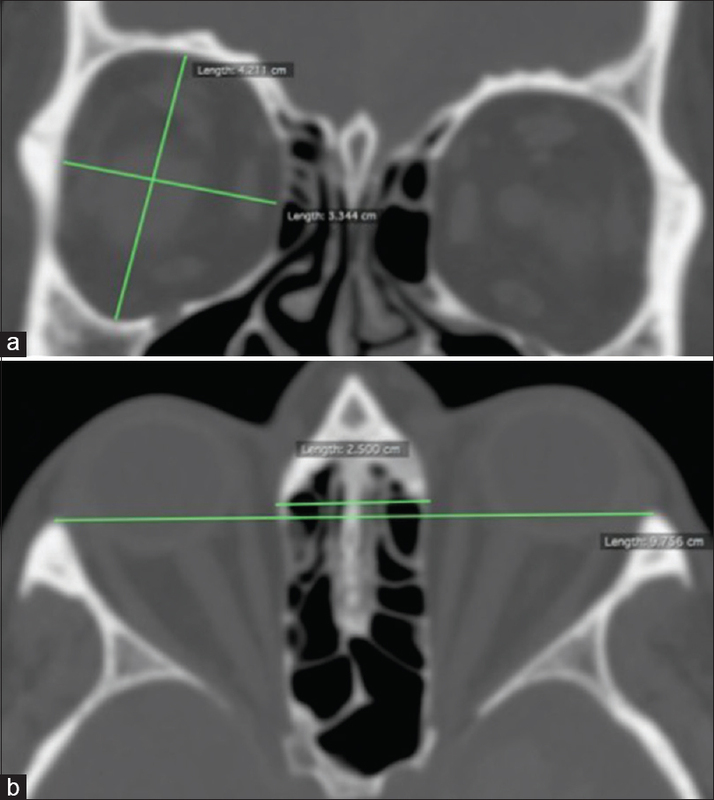 The chart review of 13 patients who underwent external DCR surgery for isolated lacrimal sac rhinosporidiosis between July 2012 and May 2018 was performed. Demographic details, clinical presentation, preoperative and intraoperative findings, surgical technique used, postoperative management, surgical outcome and duration of follow up were reviewed for each patient. Results: Thirteen patients were included in the study. Nine (69.2%) were male and four (30.8%) were female. The mean age was 22.1 years (range: 8–46 years). Involvement was unilateral in all cases. The commonest presenting complaint was epiphora with discharge seen in 10 cases (76.9%). 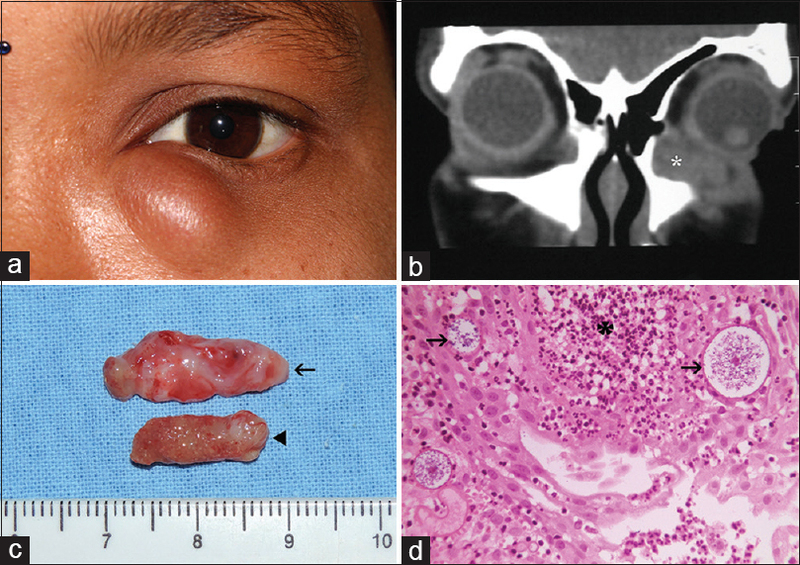 An intrasac granuloma was grossly identified intraoperatively in 12 out of the 13 patients. Mean follow up was 26.9 months (range: 1.5–68 months). Till the last follow up, all cases were symptom free and did not have any evidence of recurrence of infection. Conclusion: From this series of cases reported by the authors, external DCR with appropriate precautions to prevent recurrence appears to be a suitable alternative to conventional DCT with excellent long-term outcomes without disease recurrence. Purpose: Coping strategies employed by people with visual disability can influence their quality of life (QoL). We aimed to assess coping in patients with low vision or blindness. Methods: In this descriptive cross sectional study, 60 patients (25–65 years) with <6/18 best-corrected vision (BCVA) in the better eye and vision loss since ≥6 months were recruited after the institutional ethics clearance and written informed consent. Age, gender, presence of other chronic illness, BCVA, coping strategies (Proactive Coping Inventory, Hindi version), and vision-related quality of life (VRQoL; Hindi version of IND-VFQ33) were recorded. Range, mean (standard deviation) for continuous and proportion for categorical variables. Pearson correlation looked at how coping varied with age and with VRQoL. The analysis of variance (ANOVA) and t-test compared coping scores across categorical variables. Statistical significance was taken at P < 0.05. Results: Sixty patients fulfilled inclusion criteria. There were 33 (55%) women; 25 (41.7%) had low vision, 5 (8.3%) had economic blindness, and 30 (50.0%) had social blindness; 27 (45.0%) had a co-morbid chronic illness. Total coping score was 142 ± 26.43 (maximum 217). VRQoL score (maximum 100) was 41.9 ± 15.98 for general functioning; 32.1 ± 12.15 for psychosocial impact, and 41.1 ± 17.30 for visual symptoms. Proactive coping, reflective coping, strategic planning, and preventive coping scores correlated positively with VRQoL in general functioning and psychosocial impact. Conclusion: Positive coping strategies are associated with a better QoL. Ophthalmologists who evaluate visual disability should consider coping mechanisms that their patients employ and should refer them for counseling and training in more positive ways of coping. Purpose: This study describes a novel surgical technique of fibrin glue-assisted retinopexy for rhegmatogenous retinal detachment (GuARD) without oil or gas tamponade after pars plana vitrectomy (PPV). Methods: This pilot clinical trial included five eyes of five patients with rhegmatogenous retinal detachments (RD). 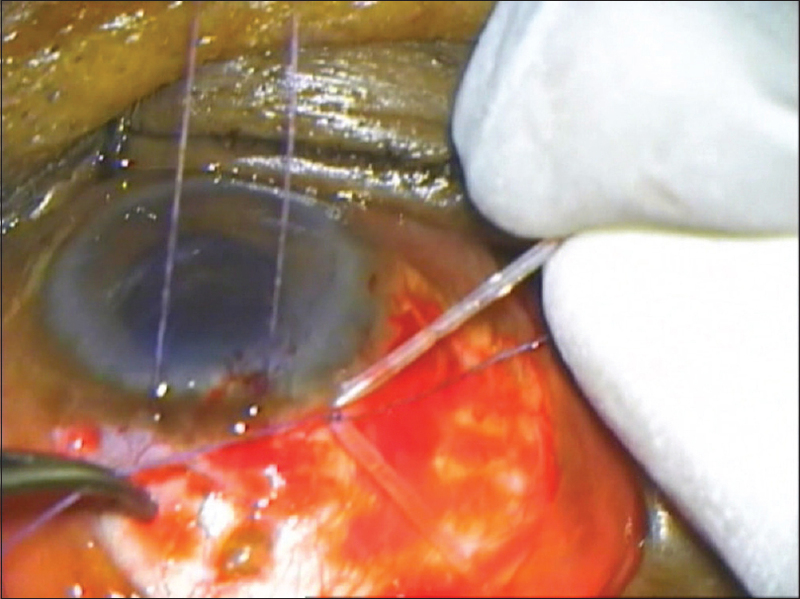 A complete PPV was done in all cases followed by fluid–air exchange, laser photocoagulation around the break/s, and application of 0.1–0.2 mL of fibrin glue. No air, long-acting gas or silicone oil was used subsequently. No specific postoperative positioning was prescribed. The primary outcome measure was efficacy of the procedure defined as successful anatomical retinal reattachment. Secondary outcome measures were postoperative improvement in best corrected visual acuity (BCVA) and complications. Results: The median age of patients was 55 (range: 36–61 years) years and median duration of symptoms was 15 (range: 7–60) days. All eyes were pseudophakic, four eyes had inferior and one eye had total RD. 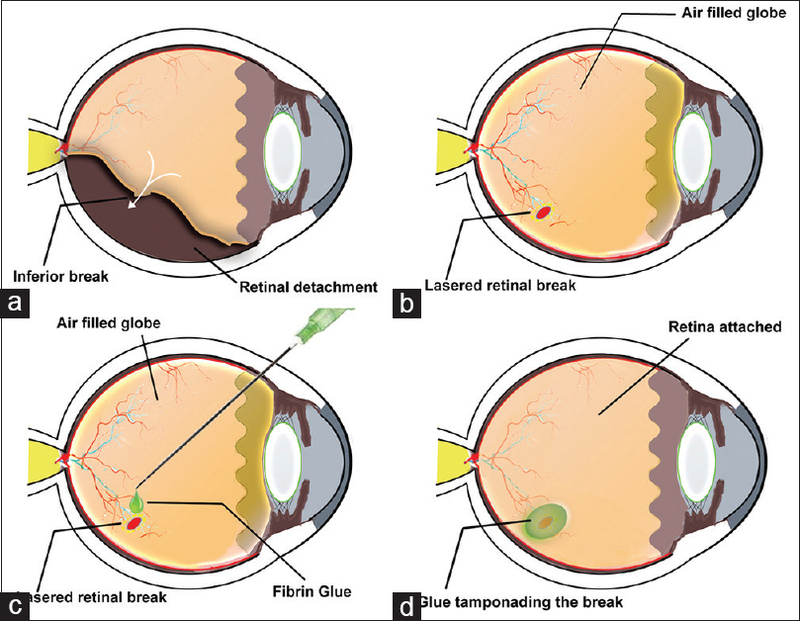 Successful retinal reattachment was achieved in all (100%) cases and was maintained at the end of 3–8 months of follow-up. The median BCVA improved from 20/100 preoperatively to 20/80 at 1-week and 20/50 at 1-month postoperatively. None of the eyes had any postoperative complications such as elevated intraocular pressures or unexpected inflammation. Conclusion: The findings of this study suggest that GuARD is a promising technique for treatment of rhegmatogenous RD that may allow early visual recovery while avoiding the problems of gas or oil tamponade and obviating the need of postoperative positioning. 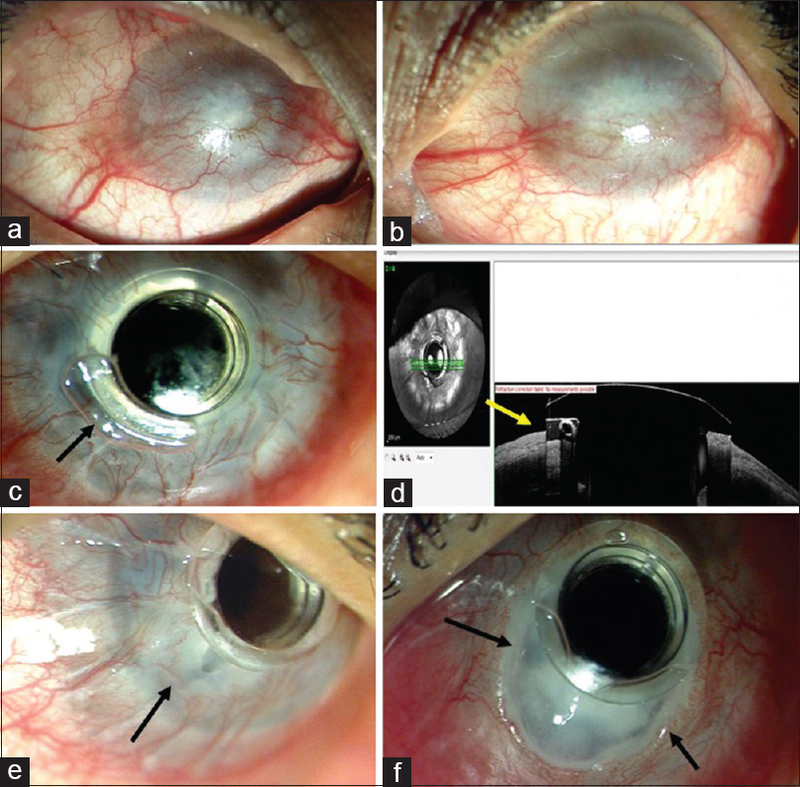 We report a novel simplified method for managing inadvertent tube cut in a patient undergoing the Aurolab aqueous drainage implant (AADI) surgery for refractory neovascular glaucoma. Tube cut occurred while applying the polyglactin ligature suture used to avoid early postoperative hypotony. The short end of the cut tube was removed and the long end reinserted into the base plate of AADI. The surgery was then completed as usual. Following the surgery, the intraocular pressure reduced to 20 mmHg which stabilized and was maintained at 10 mmHg till the last follow-up at 12 months without any glaucoma medication. 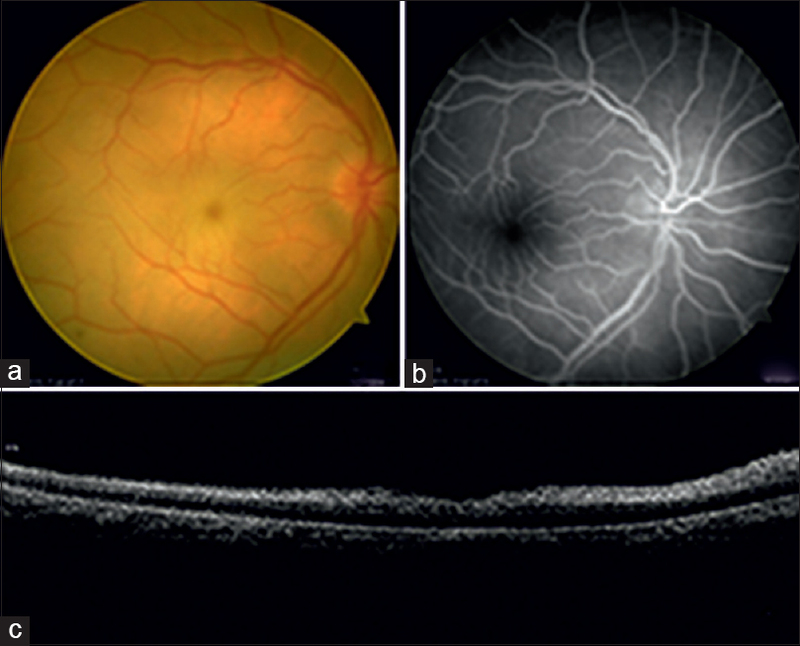 We report the imaging characteristics of focal choroidal excavation (FCE) and associated choroidal neovascular membrane (CNVM) and interpret the probable etiopathogenesis of FCE through findings in four patients detected by spectral-domain optical coherence tomography (SD-OCT). FCE was found as an acquired entity in two of our cases subsequent to treatment of CNVM, whereas in the two other cases FCE was pre-existing. Furthermore, association of FCE with pachychoroid spectrum is reaffirmed through this case series. 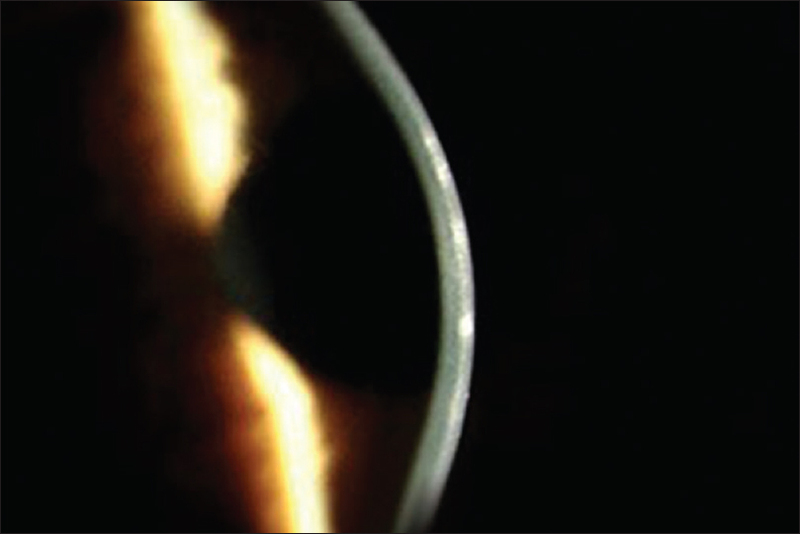 To report case of bilaterally symmetrical choroidal coloboma within posterior staphyloma with MHRD. 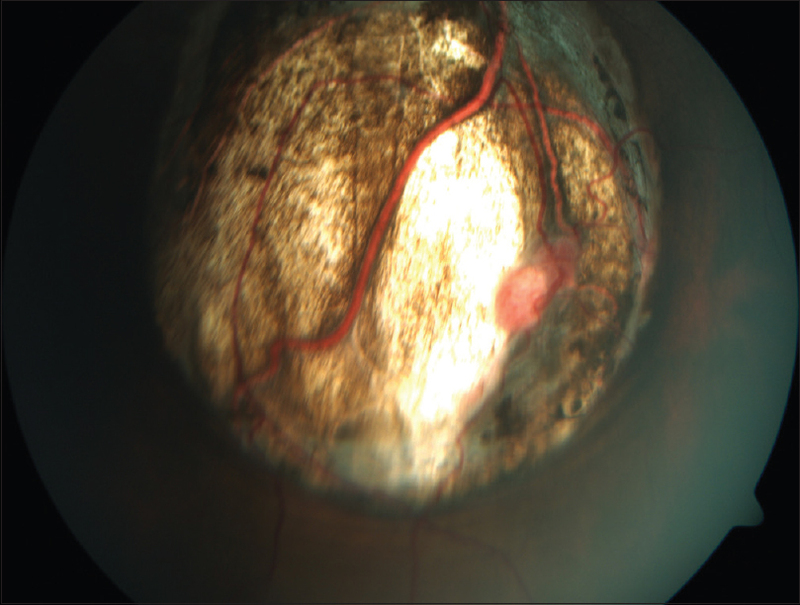 This is a case report of a 50year old female presented with diminished vision in both eyes. On examination, she had Bilateral High Myopia with recent onset MHRD associated with symmetrically bilateral Choroidal Coloboma within posterior staphyloma and was operated for MHRD in left eye. Presence of choroidal coloboma within posterior staphyloma is rare and with coexisting macular hole makes pathophysiology of RD challenging to understand. 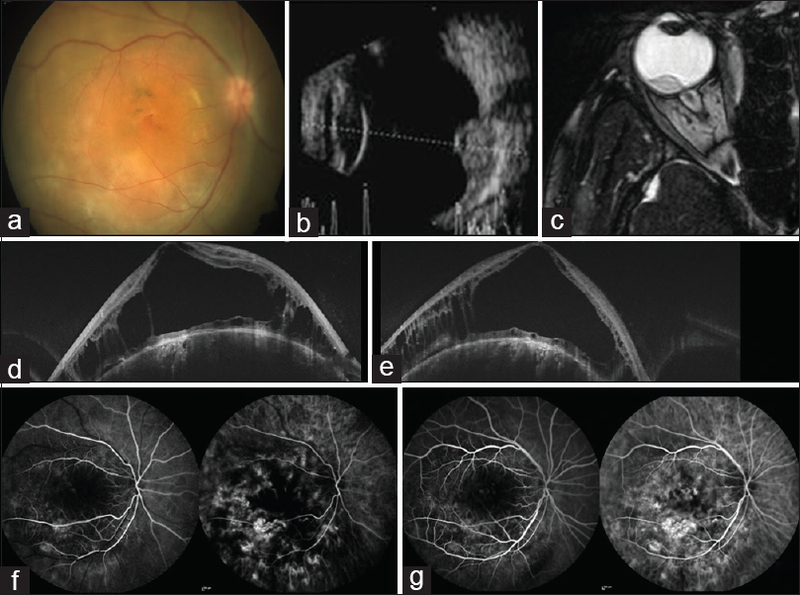 In this series, we discuss the role of optical coherence tomography angiography (OCTA) in assessing response to treatment in intraocular vascular tumors. This is a series of two cases: Multiple retinal capillary hemangioblastoma (RCH) treated with laser photocoagulation and diffuse choroidal hemangioma (DCH) with radiotherapy. In large RCH and DCH, optical coherence tomography (OCT) showed significant reduction of subretinal and intraretinal fluid. But post-treatment mean tumor vascular density (MTVD) was slightly reduced. In one small RCH, vascular loop was seen suggesting minimal residual disease. So, OCTA helps in identifying treatment inadequacy and understanding alternate mechanism involved in treatment response in vascular tumors. 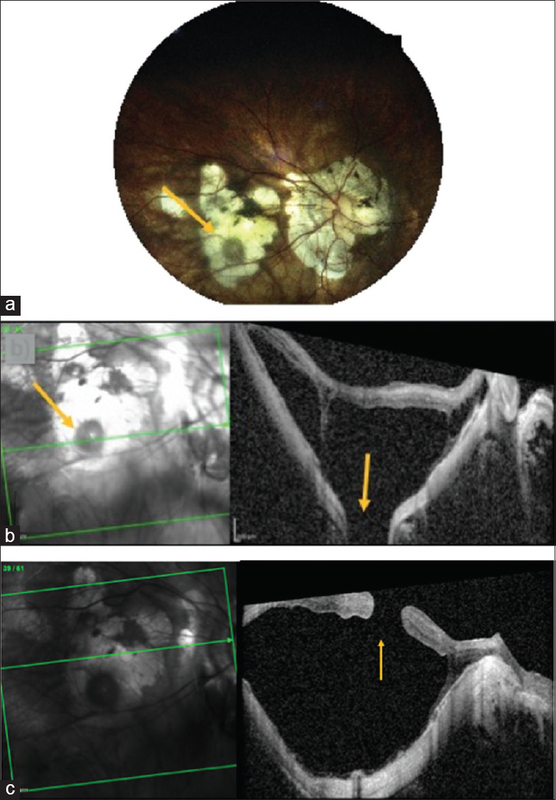 Circumscribed choroidal hemangioma is a benign vascular hamartoma without systemic associations. 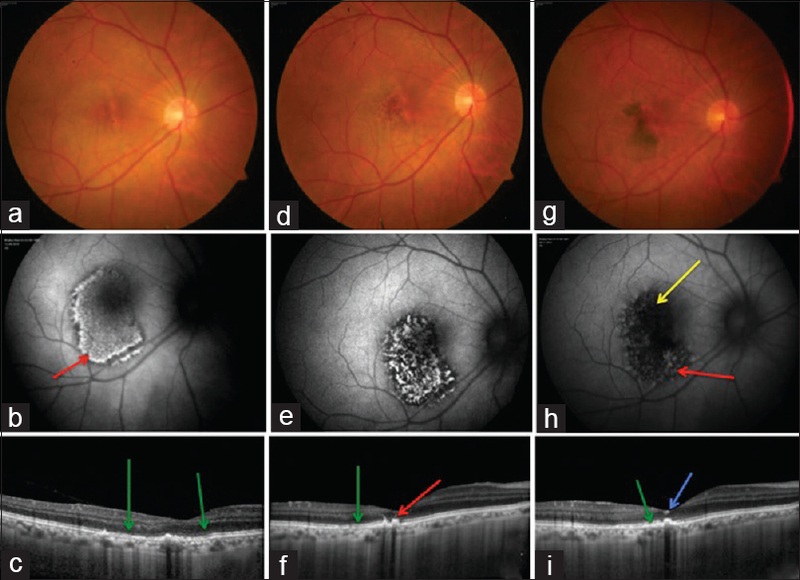 For symptomatic cases, treatment options are photodynamic therapy (PDT), transpupillary thermotherapy (TTT), intravitreal injection of anti-vascular endothelial growth factor (VEGF), or radiation therapy. CyberKnife radiosurgery is an image-guided radiation therapy that delivers radiation to lesions anywhere in the body with an accuracy of 0.5 mm without damage to surrounding structures. We report a case of circumscribed choroidal hemangioma which was successfully treated with CyberKnife therapy. The literature search reveals cases of uveal melanoma, intraocular, and periocular lymphoma successfully treated with CyberKnife therapy. To the best of our knowledge, this is the first report on such treatment for choroidal hemangioma.